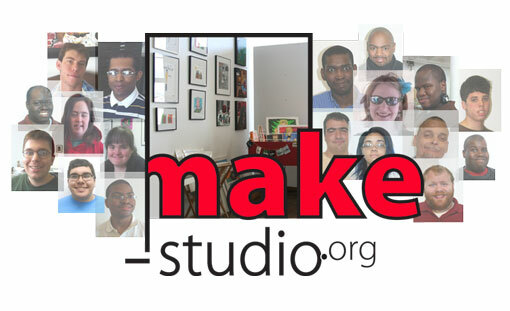 Make Studio is a nonprofit studio art program that provides workspace and other supports for emerging artists with disabilities. We primarily do this by operating a working studio 4 days/week in which participating artists receive vocational mentorship from arts and human services professionals. Through the active promotion of its artists and their stories, via exhibitions and outreach activities, Make Studio showcases fresh artistic perspectives and also works to dispel pervasive and destructive stereotypes about difference. Interns receive job experience by providing assistance with a wide range of organizational and program tasks. Specific assigned tasks are based upon the individual intern’s experience, background, and interests, but can include providing direct support of our participating artists (e.g., helping them to choose, prepare, and utilize materials in the studio), preparing exhibitions, compiling grant proposals, preparing and distributing marketing materials, working with volunteers, and running outreach events.